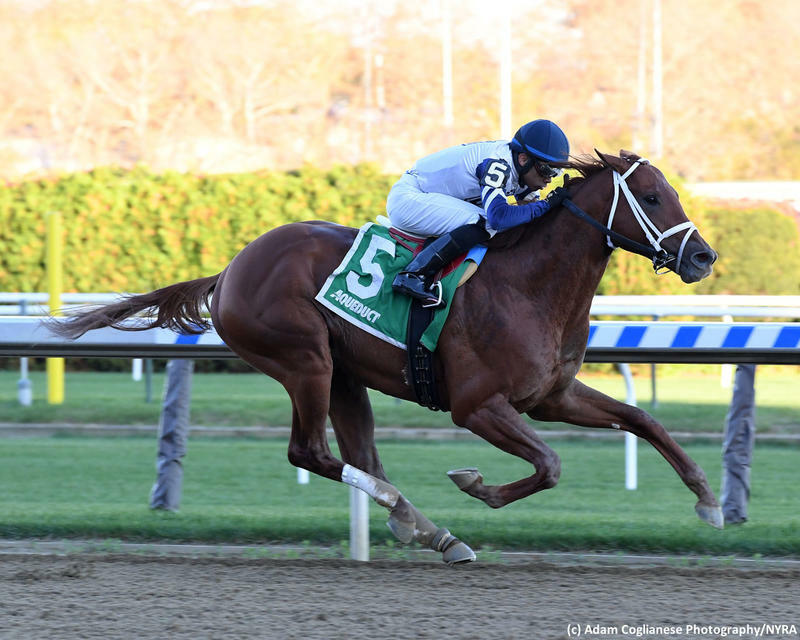 Kentucky Derby implications abound in Saturday’s $1 million Blue Grass (G2). A full field of 14 has been entered for the 1 1/8-mile test at Keeneland, one of seven major qualifiers in the Road tothe Kentucky Derby series, and all need points to qualify for the first leg of the American Triple Crown. A total of 170 points is in the offering for the first four finishers (100-40-20-10 scale). Vekoma has been installed as the 9-5 morning line favorite following a third in the Fountain of Youth (G2) at Gulfstream Park. Winner of the Nashua (G3) at Aqueduct, the George Weaver-trained colt was beaten only 2 3/4 lengths while sustaining his first career setback last out. Vekoma gets a new rider in Javier Castellano. Win Win Win, third as the favorite when making his first Kentucky Derby qualifying attempt in the March 9 Tampa Bay Derby (G2), comes next at 7-2 on the morning line. Irad Ortiz Jr. retains the mount for Mike Trombetta. Signalman has shown an affinity for Churchill Downs, recording a fast-closing third in the Breeders’ Cup Juvenile (G1) and a victory in the Kentucky Jockey Club (G2) under the Twin Spires, and the Kenny McPeek pupil also finished second in the Breeders’ Futurity (G1) at Keeneland last fall. But after opening 2019 with a seventh in the Fountain of Youth, Signalman currently sits only 23rd on the Kentucky Derby leaderboard with 18 points. Regular rider Brian Hernandez Jr. will be up. Winner of the Jeff Ruby Steaks (G3) on Turfway Park’s Polytrack, Somelikeitbrown tops all Blue Grass entrants with 20 points (21st on the leaderboard). He’ll try to gain ground in the standings while making his first dirt start for Mike Maker and Tyler Gaffalione has the assignment. Todd Pletcher, a two-time Kentucky Derby-winning conditioner, has Sam F. Davis (G3) third-placer So Alive in the mix. Churchill Downs-based trainers Mark Casse and Dallas Stewart both have a pair, with Casse sending out Dream Maker and Sir Winston and Stewart represented by Aquadini and Chess Chief. Rounding out the field are Admire, Lucky Lee, Market King, Moonster and Parsimony.